The Scarborough RT tracks. Photo by Randy McDonald from the Torontoist Flickr Pool. Books can and will be written about the planning of the proposed Scarborough subway extension. Herein, all we can try to do is offer a brief(ish) summary of how we got to the point we’re at now, which is that we’re building the thing. More or less. Probably. Eventually. Scarborough is no worse than most post-war North American suburbs and better than many, largely thanks to Metropolitan Toronto’s growth planning efforts. They decided, among other things, that the city needed mixed-use job nodes outside downtown and designated sites around the civic centres in North York and Scarborough. They haven’t turned out quite as planned, but it’s nonetheless significant that, in recognition of its growing population and need to intensify, Scarborough was provided with a rapid transit line in 1985. No, it wasn’t an underground, high-capacity subway, but it wasn’t a slight—local politicians praised it at the time. Mayor Gus Harris pointed to the RT as evidence that Scarborough was “the city of the future.” The province hoped that the innovative RT technology would become a new standard and, okay, that didn’t turn out quite as planned either. By the 2000s, it was on borrowed time and in need of replacement. As the 2000s dawned, regional planning, transit planning, and transit expansion came back into style. We got a double-shot of love with David Miller unveiling Transit City and the province agreeing to fully fund the $8.2-billion cost as part of its transit plan, The Big Move. It envisioned a network of versatile light rail lines crossing the city and providing connections to priority neighbourhoods in the city’s under-serviced inner suburbs. It wasn’t perfect, but if we’re grading on a bell curve, it’s totally the least stupid transit plan in recent history. Under Transit City, the RT would be rehabilitated and extended to connect with the new Sheppard LRT. The also-new Eglinton (Crosstown) LRT would have seven stations spread over nearly 10 kilometres through Scarborough, while another line would have extended out to Malvern. The best part? Not only was there no cost to Toronto taxpayers, it could all be up and running by 2020! Mayoral candidate Rob Ford spoke with the people of Scarborough and they told him one thing, folks: they want subways, subways, subways. They don’t think it’s fair that downtown—where there’s a lot of people living close together and also lots of jobs and cultural attractions—has multiple subway stops while all Scarborough gets is an outdated thingie. 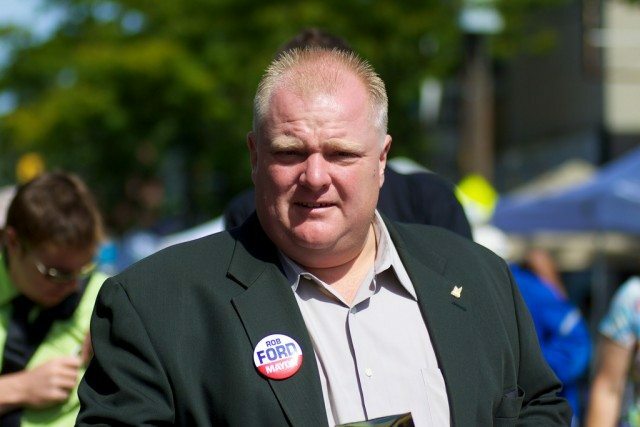 Rob Ford campaigning. Photo by Dan Cronin from the Torontoist Flickr Pool. So the first thing Mayor Ford did (after letting Don Cherry insult residents) was stab Transit City through its liberal bleeding heart. It wasn’t entirely legal, but no one much complained. Only the Eglinton Crosstown survived the purge, though Ford insisted it run entirely underground, without knowing how much that might cost. Even though it was their money, the province said they’d abide by the wishes of newly-elected mayor, provided the City pick up all the new costs. By March 2011, the province and City negotiated a memorandum of understanding (PDF) outlining the details of Ford’s new plan, formalizing the death of Transit City—provided city council affirm the deal in a vote. The next few months were like a war of attrition. The MOU never went before council for approval, and there were all sorts of backdoor plans going on, and a great deal of acrimony. TTC commissioner and councillor John Parker decried the Crosstown plan as “the goofiest LRT line known to man,” due to the plan to go under the Don River. TTC chair Karen Stintz tried to convince Ford he could have his cake and eat it too if he didn’t bury Eglinton, using the money to build at least some of the Sheppard and Finch LRTs. He rejected her entreaty and, as we found out later, she went rogue. In short succession, TTC general manager Gary Webster was turfed for offering his professional advice that the LRT plan made more sense and the Globe and Mail ran an editorial “written” by Rob Ford, in which he endorsed using a parking tax to raise money for transit—something which actually became less bizarre when he rejected his new position almost immediately. We now know a lot more about why, but Ford was losing control of the transit file and council. The TTC board was replaced, and Ford’s political credibility was damaged. Now there was blood in the water. Stintz, the erstwhile Ford appointee, had joined forces with Glenn De Baeremaeker, the Scarborough councillor and Transit City supporter who once favourably compared light rail transit technology to iPads. In June, Stintz and De Baeremaeker were ready to show their new baby to the world and it was called OneCity. Effectively a transit coup d’état, OneCity—which came with a map and everything!—proposed $30 billion of transit over 30 years, including a restored Transit City and a way to pay for it, via what amounted to a property tax hike (the plan would reallocate the CVA uplift, a way of passing a property tax increase that no one would understand). It was a great stunt but it was dead by July. At the TTC’s October meeting, the ever-tenacious De Baeremaeker (now a subway True Believer) and Etobicoke flag-bearer Peter Milczyn asked the TTC to look at whether a subway would be best after all. While the TTC gamely went off to do what they were told, the MOU was formalized with the signing of a master agreement, a binding contract between the City and province. Phew! Remember that binding contract from one sentence ago? Well, that notwithstanding, staff reported back in January (PDF) on De Baeremaeker’s motion. It basically said that, technically, either a subway or LRT could work but given all the time this was taking, and given the need to replace the aging RT, there was no good reason to debate it all again. Obviously this meant council would have another debate. The sands began shifting in the spring. First, the province started getting wishy-washy. The premier reaffirmed her commitment to council’s plan and then her newly appointed transportation minister, Glen Murray, said the province was open to reconsidering projects in The Big Move, but also that they weren’t. What about Metrolinx, the organization consisting largely of engineers and planners whose entire raison d’être is “to provide leadership in the co-ordination, planning, financing, development and implementation of an integrated, multi-modal transportation network”? Remember when the mayor and council asked them to opine on what the best route and/or route might be? Remember when the TTC chair insisted Metrolinx staff attend the council vote to answer questions and offer perspective on how the various proposals fit into the bigger picture of regional planning and growth in the GTA? Yeah, that never happened. which, on the surface, contains the usual even-tempered government language. Translation: WTF is your [email protected]#$#ing deal? Pick what you’re building already because whatever you do is stupid but we don’t give a crap anymore, even though we just signed a contract adopting a new plan that you guys voted for! Oh, by the way, you’ll be paying all the costs for the time we’ve spent and contracts we’ll have to break. It’ll probably be around $100 million. Good luck, jerks. Then to spice things up, Scarborough MPP Margarett Best resigned, so it was time for the (relatively) staunch provincial government to start being as political as everyone else. How much is one by-election worth? Well, with Scarborough-Guildwood up for grabs and the other parties going all “subways, subways, subways,” Glen Murray was suddenly open to reconsidering the previous deal. Hey, even NDP candidate for Scarborough-Guildwood Adam Giambrone, who was the TTC Chair during the development of Transit City, suddenly supported subways. To be against the proposed subway plan was to be perceived as anti-Scarborough, or so the thinking went. The politics worked for a lot of different stakeholders too. Karen Stintz hoped to use her subway extension gambit—a remnant from OneCity—as a springboard to take on Rob Ford in a mayoral election, and to show her Scarborough and subway bona fides. Feeling politically vulnerable, the Liberals could score some extra votes, and perhaps download some transit costs to the city at the same time. Rob Ford came to the party late, but supported the Scarborough subway extension and tried to take credit for it although Stintz and De Baeremaeker did a lot of the work. In July 2013, finally, city council did it. They had a huge council meeting and approved the Scarborough subway in principle. The video above is the nadir not just of the debate that took place, but arguably of the Rob Ford era. There were some actual arguments to be made in support of the subway but you won’t find them here. Instead you see the mayor of Toronto demonstrating, with every exasperated sentence he utters, that he knows next to nothing about the subway he so adamantly supports and even less about the LRT he even more adamantly opposes. If human beings had gaskets, you’d see Councillor Josh Matlow blowing them as he ineffectually swings his sledgehammer of facts, vainly trying to knock a hole in the amorphous cloud of ideology surrounding Ford. The whole day went like this and if you’re thinking, “Gee, I don’t usually watch council. Surely this isn’t how they always make decisions?” um, whatever helps you sleep. The decision—their third reversal—was also contingent on the province giving the City more than the $1.4 billion they emphatically declared they was their limit, with the City chipping in some from a new 30-year property tax hike that the mayor himself neither understood nor approved of. It would cost $2.3 billion of largely imaginary money, and have three whole stops. That still wasn’t the low point. The Liberals held on in their by-election and all of a sudden the transportation minister, leaping over Metrolinx, the City, the TTC, and everyone else, had his own plan! The subway would be two stops, instead of three, 6.4 kilometres instead of 7.6, but within the existing $1.4-billion budget. Everyone’s happy! Still not political enough for you? Enter federal Finance Minister Jim Flaherty, who saw a perfect opportunity to help Scarborough (and pal Rob Ford) while simultaneously sticking it to Wynne. He found $660 million to throw into the pot for Ford’s plan, not Murray’s or anyone else’s. Oh, and it wasn’t dedicated funding, just an advance on Toronto’s entire share of a new federal infrastructure fund with no council discussion on whether that was the best way to spend it. But, shhh! In October, council made the decision final. Council approved a 30-year 1.6 per cent property tax revenue increase phased in over three years (worth $745 million), as well as allocating $165 million worth of development fees to the proposal (developers later sued over this part of the financing). The numbers were complicated, and poorly understood by many councillors—Torontoist made an interactive at the time to help sort out the implications. But council narrowly backed the subway plan, with the decisive votes coming from Ana Bailao and Anthony Perruzza. It was all over, right? But no! Then it was election time, the best time for people to make up their own transit systems! For the Ford brothers, it meant handing out subways like Oprah Winfrey giving away cars. For Olivia Chow, it was building the downtown relief line and improved bus service, both plans backed by actual staff recommendations (novel!). And candidate John Tory? He had a point when he said this Scarborough debacle had gone on long enough so it was best to just move on and build it, along with a little thing he’d just come up with, which he insisted would cure Toronto’s transit woes, a little dream called SmartTrack. But then he got elected. And Tory’s SmartTrack ran close to the same route as the proposed subway extension he didn’t want to mess with. Something had to give, so Jennifer Keesmaat and her planning staff devised the compromise of compromises. Dig it: First, we’ll just snip two stations off the subway extension. Now there’s only one, so it’s basically a huge tunnel going to Scarborough Town Centre. That sounds kind of wacky but now we have extra money we can use to restore the Crosstown East LRT (17 stops! ), all for the mythical low price of $3.56 billion. There was some debate about whether any of this made sense. But the LRT provided something sensible and the subway, well, it provided reason to hope for transit-oriented development in Scarborough (even though little had happened in 30 years to date) and for the pro-subway crowd to declare victory. Council approved it in July and then the clouds parted, the sun rose, unicorns rode free through the valleys and fields, and all was right in the land. No, council has not reversed itself a fifth time. The compromise remains intact, at least for now. It’s got a website and everything! In the least-possible shocking development, it emerged early this year that the $2-billion subway would actually probably cost $2.9 billion. Despite the 30 per cent increase, the mayor and subway supporters were not fazed. Where would the extra money come from? 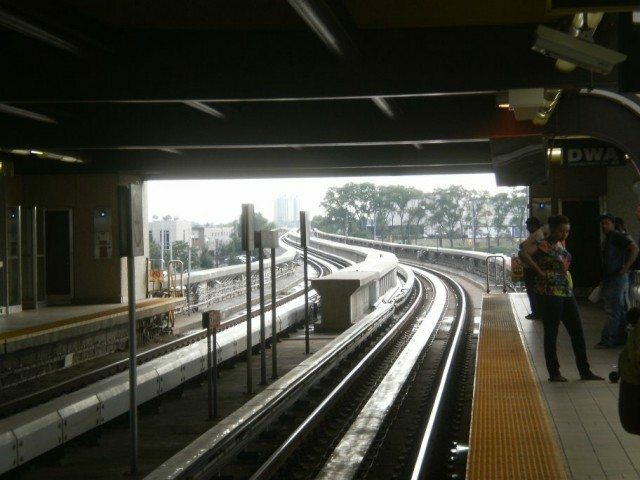 How could we still build the subway and LRT? Stop asking questions, you negative naysayer! And what of news that the ridership projections were “problematic” and almost certainly way above anything that would justify a subway? Also irrelevant. Luckily, we know that once everyone agrees on a projected budget, it never goes up again. Especially on TTC projects. Except, no, it happened again already. Just last week it came out that $2.9 billion isn’t right either. The budget is up 10 per cent, to $3.2 billion, and the timeline to open by 2025 is hanging by a thread. The mayor remains confident, still. What’s next in this ongoing drama? Geez, don’t even try to guess.